Oh, Deer! 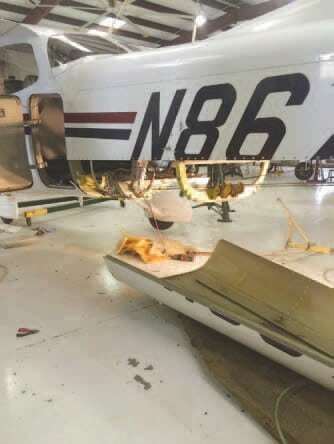 | Tennessee Aircraft Services, Inc.
taxiing just a little too close to the hangar = wing tip leading edge damage and aft wing spar compression. Most damage leads to obvious repair schemes. Every so often, a plane finds something to hit that presents damages for which there may be uncertainty what repair is prudent vs. what is minimally required. When I worked for a commuter airline, one of our HawkerSidley 748 twin turboprop 44 passenger airplanes hit a deer. The plane was on take-off roll when three deer ran onto the runway, but only two made it across to the other side. The guys in the tower saw the event happen and said the third deer just vanished. The flight was aborted with no injuries, except for the deer, of course. It’s amazing what a couple thousand horse power and 12.5 foot diameter four blade propeller can do. The plane was thoroughly inspected with no damage found and declared ready for flight. 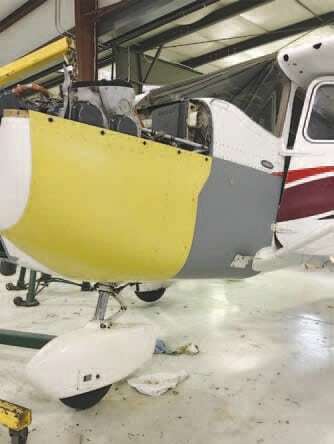 The story is quite a bit different when a Cessna 172 crosses paths with a deer with only 180 horsepower and a 76 inch diameter two blade propeller. The deer still doesn’t make it, but the plane sustains some serious bruises. On this particular event, the deer finds the very tip of the propeller, the lower left cowling, lower left forward cabin skin, and the lower aft tail cone skin. The plane is still flyable but will need some work. New lower left cowl skin and forward cabin skin replaced due to deer impact. Lower tail cone skin removed with airplane secured. A holding fixture is used to prevent the tail from folding while the skin is removed. The sheet metal work is simple enough, but some decisions must be made about how much attention the engine requires. There is visible DNA evidence on the propeller tips to show some sort of prop strike occurred. However, there is no report of decreased RPM nor any measurable bending of the propeller blades. Unlike a Continental engine in this situation, there is an FAA document for the Lycoming engines that must be addressed. FAA Airworthiness Directive AD 200410- 14 C addresses propeller strikes on certain direct drive Lycoming engines. Compliance is mandatory after any propeller strike or sudden stoppage. The first important task is to determine what constitutes a propeller strike. Fortunately, paragraphs (i) and (j) of the AD do just that. Any incident during engine operation in which the propeller impacts a solid object that causes a drop in revolutions per minute (RPM) and also requires structural repair of the propeller (incidents requiring only paint touchup are not included). This is not restricted to propeller strikes against the ground. A sudden RPM drop while impacting water, tall grass, or similar yielding medium, where propeller damage is not normally incurred. Since there is no detectable damage to the propeller we can skip past paragraph (i)(1). A deer is a solid object but with no perceived drop in engine RPM, paragraph (i)(2) is also not applicable. Paragraph (i)(3) doesn’t fit the situation nor does paragraph (j), so no action seems called for per the AD. However, there are times when reason speaks up and urges some action based on more than the minimum requirements. This is one of those times. Since there is no FAA airworthiness requirement to take action on the engine, the ultimate decision falls to the owner/operator. My input to the owner/operator includes a real concern for the unknown of what damage could occur to the lighter duty rotating parts of the engine. When the propeller impacts anything substantial, there must be some reverberation throughout the engine. Of primary concern would be the plastic gears in the magnetos. In an abundance of caution, the inspections called for in the AD are performed as well as replacing the magnetos. The AD refers to Lycoming “mandatory” service bulletin 475C for the inspections and possible repair methods to be used. Even though we’re voluntarily complying with the AD, it is important to note that the AD does not call for compliance with the service bulletin as a whole as one might assume. A proper reading and it’s clear the AD only calls for specific parts of the bulletin be performed. The reference to the bulletin in the AD specifically calls to “inspect, and if necessary repair, the ……in accordance with steps 1 through 5” of the bulletin. This is a very limiting statement. A small, but powerful, detail about manufacturer service bulletins is they are not completely FAA approved, as many people assume. In most cases there is a statement in the introduction of a bulletin clarifying that the “Engineering Aspects are FAA Approved”. That means any change in the engineering related information of the bulletin must be approved by the FAA. Everything else in the bulletin may be changed at the manufacturer’s whim with no input or approval by the FAA. When ADs and SBs are concerned, the AD is always controlling. In today’s example the compliance times and applicability are not the same in the two documents. The AD compliance is only called for after prop strike. The bulletin calls for compliance at overhaul, prop strike or anytime the crankshaft gear is removed. The FAA AD is focused on actions needed after prop strike, and the technical aspects of the bulletin adequately address that. The bulletin was created, mainly, to address a problem with the design of the crankshaft gear that would also present itself after prop strike. 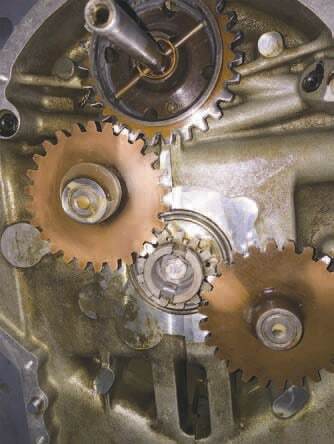 The crank shaft gear is the small one with the bolt in it’s center. Rotation is limited by a dowel pin which is the primary inspection item for prop strike. The FAA AD applies to all direct drive Lycoming engines except O145, O320H, O360E, LO360E, LTO360E, TO360E, O435, and TIO541 series engines. The bulletin applies to all direct drive Lycoming engines including the VO360 and IVO360 and excepting the O320H, O360E, LO360E, TO360E, LTO360E, and TIO541 series engines. It’s subtle, but the FAA excludes the O145 and O435 series engines and Lycoming does not. Had the FAA AD simply required compliance with the bulletin as a whole, then these two engine series would automatically been included by reference. What to do about prop strikes on direct drive piston engines has evolved over the few decades that I’ve been involved in aircraft repair. Back in the “good old days”, a prop strike inspection might include measuring the deflection of the engine’s crankshaft flange and installing a new propeller. For various reasons, Continental and Lycoming decided to create bulletins to address the issue. Lycoming published SB533B in 1998 and Continental published SB9611B in 1996. Lycoming’s SB475C isn’t the only bulletin they issued for prop strike; it’s just the only one the FAA addresses in an AD. Lycoming also issued SB533B for guidance specifically directed to prop strikes. It defines a prop strike and provides a five page chart to be completed showing all the work items Lycoming recommends. Continental issued SB9611B to provide guidance on prop strike incidents. It includes their definition of a prop strike and the inspections and repairs they require. Continental’s bulletin gives very explicit instructions for the complete tear down of the engine with precise listing of what and how the parts must be inspected. They aren’t taking any chances with the mechanic in the field making the decisions. Our subject engine’s accessory housing is removed for access to the inspection items listed in the Lycoming bulletin. Fortunately, everything checks out perfect. All gets put back together along with the replacement magnetos. Some might suggest all this effort is a waste since nothing bad was discovered. However, not opening the back of the engine would always leave a question in the operator’s mind when flying. There’s an intangible benefit to knowing something is secure instead of hoping it is. Not that compliance with these bulletins isn’t highly recommended, but it is valuable to know what is truly required and why. The FAA has only seen fit to issue the one AD on the Lycoming engines pertaining to prop strikes and nothing for the Continental engines. This indicates an engine’s history of a prop strike isn’t resulting in a sufficient number of failed engines or operator deaths to get the attention needed to issue an AD. That could be because prop strikes don’t cause engine failure or that the vast majority of operators are proactive in ensuring these basic inspections are being performed. In today’s litigious world, available insurance coverage for these inspections drives demand, so I feel confident in believing proper inspections are helping keep these engines running and the pilots and passengers safer.